The Yamaha my father owned when I was a boy had two wheels and moved quite rapidly when you gave her a little gas. I guess, when you think about it, the only thing in common between a motorcycle and a syntheszier is that they both make a lot of noise. Anyway, the Yamaha I carried from St. Mary's Church to the WXPN studio after last night's Gathering had zero wheels and emptied my personal tank of any remaining gas. Ha! And I thought a 1500-page book I had toted around with me most of the evening was cumbersome. My now-two-inch-longer right arm will attest to what was truly heavy. Turns out the walk between venue one and venue two isn't so distant, but those three flights of stairs up to the studio are killers. Jeff Towne was an out-of-towner for the night and a few normal event loafers, including myself, chipped in with last night's event. Give Warren Seddon the gold-medal version of the In Absence of Jeff Award, as he took a crash course in stage lighting and did a remarkable job with last night's one-and-only American performance by Scotland's "Under the Dome". As Warren has it, Jeff and he got together a few nights before the gig and the tricks of the lighting trade were rapid-fire revealed. Complications ensued between this course and the gig as Warren's 13-year-old son would suffer a rather-serious accident. The medical problems had still not been solved by last night (a surgery to reset a broken leg was still to be done), but Warren came through like a champ. He had listened to Under the Dome's brand-new release, called "Wot no Colin?," multitudes of times pre-concert. This was in order to familiarize himself with the band's music and style. As a result, the lighting show worked in perfect tandem with Under the Dome's stage performance. Dennis Haley filled in admirably for the missing multitasking Towne, handling the CD sales table. I wasn't about to let him off easy because of his newbie status. We all have the same "I want the CD that sounds just like what we heard!" demand, so when I put him to the task, Dennis immediately directed me to the above-mentioned new-release "Wot no Colin?" (named such due to the lacking of half-the-Dome-duo member/guitarist Colin Anderson). "Ah, but Dennis. This band works so well with the guitar sound and since Colin is missing from this one..." I pointed directly to the liner notes of the CD, where it lists the contributors. Anderson is listed there as a band member, but ... "See, Dennis? It sez right here next to Anderson's name that he performs 'absolutely nothing!' He's like Jeff Towne. He wasn't there. Again, I need the guitar sound, my man. So tell me. Which CD are *you* buying?" "Wot no Colin? ", he replied. So I bought it anyway. I guess the third "unusual" volunteer was me, who would be accused by photographer Bill Forcier of "milking" the unraveling of a horribly twisted extension cord during the tear down. I would make up for this by later carrying the Yamaha. In regard to the Yamaha, I played my cards right. Once I walked into the radio studio with it in my hand, there was no getting rid of me. I would stick around for a good portion of the STAR'S END broadcast, which included the traditional post-Gatherings WXPN-live radio performance... this, of course, being the Under the Dome version. Worth noting is that when sound-engineer Art Cohen and the band were chilling in the artist studio, burping various beverages and whatnot, just before the 2 A.M. radio concert, Art described to the band the juxtaposition of the sense of relaxation and comfort of performing while being enclosed in a small, cozy studio with the sensation of awe at the realization that your sound is being transmitted on the infinite airwaves. Chuck van Zyl and Art had performed numerous radio concerts in the past and Art would say to Grant Middleton (the other member of Under the Dome) and Anderson, just before they aired, "Chuck and I have created our best efforts under these circumstances." I don't think Art was trying to relax the artists, as Colin and Grant already seemed quite at-ease. 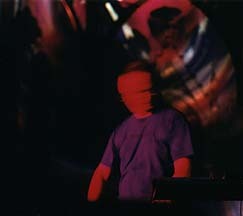 Moreso, Art offered a clue of how potentially powerful an experience they might be about to have. Listening to this, I thought of the performances I had heard over the radio that had come from this same room. The birth of Jeff Pearce's "The Light Beyond", some truly classic Steve Roach moments, The Ministry of Inside Things ... the list is endless. Forty-five minutes into the radio concert, I found myself alone in the sound room. 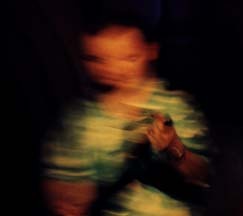 I was looking through a window at the performers and the sound was coming out of a pair of speakers behind me. Colin and Grant had reached a special place. The music transfixed me. 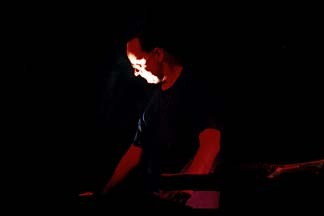 Grant Middleton is a joy to watch as he works his synthesizer. Especially during his Gathering performance, he would often slouch directly over his keyboard, his nose nearly touching his nobs, making him appear like he was nearsighted, and performing with such a level of intensity that one might imagine he was offering a patient brain surgery. 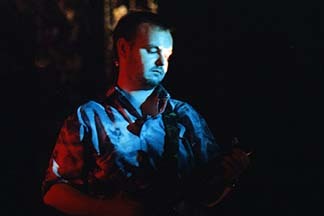 Anderson's playing personality is the opposite, and tends to lead one to believe that he is "less busy" on stage. This fellow is about as laid back as you can get. Yet Anderson's contributions to the sound are flawless and enhanced what Middleton was doing to higher levels. Take note future Gathering performers: Under the Dome offered the audience a soon-to-be produced CD-R of both the Gathering and radio concert for a reasonable price, and the response seemed to be enthusiastic. The two hours the pair performed at the studio were meandering and easy in nature. I would listen to the second hour during my long drive home. A perfect ending. 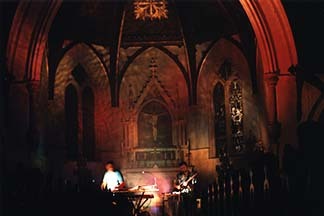 In comparison, Under the Dome's live Gathering performance was highly diversified. Sometimes ambient, sometimes heavily sequenced, sometimes romantic, and conclusively intense in a climatic, progressive style. The boys from Scotland were a grand success with the appreciative assembly of Gatherers. I'd like to personally thank Chuck van Zyl for permitting me to share the space Saturday night. Under the Dome played their first US concert at The Gatherings Concert Series in Philadelphia last night. Also, their new CD "Wot No Colin?" was available for sale. The concert covered alot of the material on the new CD. It was an evening of sequencing bliss! Grant and Colin played a one hour set and then, after an intermission, came back and played about another 40 minutes - and then surprised the crowd with an encore... a cover of Tangerine Dream's "Monolight"! After the Gatherings concert, they moved to the studio of WXPN radio where they did 2 sets on the STAR'S END radio show. The first set featured some sequencing but overall was more mellow than the earlier concert performance. And the second set was very laid back ambient. It was great to experience the wide musical diversity that UtD is capable of performing. All in all, a great night of EM... thanks very much to Grant and Colin for making the trip! 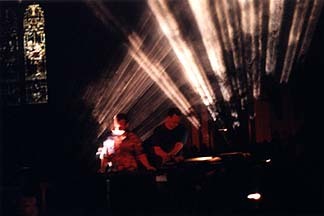 This past Saturday night in Philadelphia, I had the rare privilege talk to, and then witness, 2 men performing some the finest ambient/electronic today. Grant Middleton and Colin Anderson, better known as Under the Dome. A relatively obscure, unknown band from Scotland, I surely expect to see greater things happening to them in near future. Their music is a strong derivative of the old "Berlin-School" synth music made popular by electronic giants Tangerine Dream, Jean Michel-Jarre and Kraftwerk. 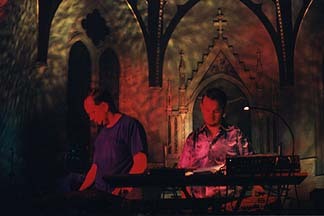 Grant Middleton plays keyboards and Colin Underwood plays e-bow/guitar while also handling some of the keyboard duties. Under the Dome flew over from Scotland for this very special one time appearance in the states. 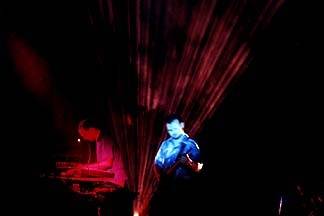 Unlike alot of performing ambient/electronic artists, Under the Dome's performance was very structured with little room for improvisation. Colin Anderson said it's the "perfectionist attitude" in him that leads to the bands tightly woven performances. And it certainly shown last night. Their two one hour sets were simply mesmerizing and everything a fan of this genre could ask for. 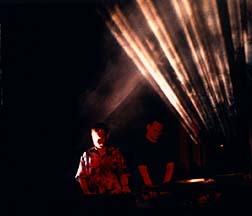 Throughout the night, Colin and Grant managed to create beautiful melodic passages, quiet ambient-like chordal duets, while eventually culminating and blending into a dynamic crescendo of music highlighted with an intense rhythmic sequencer backdrop pulsating underneath Colin's eerie guitar playing and Grant's synths. Afterwards, the band went live on air on Chuck van Zyl's one-of-a-kind radio show STAR'S END, which can be heard weekly on Philly's WXPN, 88.5, from 1 AM until 6 AM Saturday evenings. You can also catch Chuck's show over the internet if you're out of the Philly market area. Go to www.starsend.org for more details on that. On 'XPN, Under the Dome did a 2 hour live performance that was just simply amazing considering the fact that they just came off from doing an intense live concert only a few short hour ago. Filled more with ambient overtones, the 'XPN show was haunting and beautiful. So far this band has two studio CDs. "The Demon Haunted World" and "Bellerophon". Both CDs are excellent and highly recommended. They also have a live CD entitled "Wot No Colin?". An inside joke referring to a concert date that Colin could not attend, and a CD of unreleased tracks recorded at various times in the band's past. Sorry, I can't remember the name of this disc at the moment. There is a new disc being made that's going to be limited to 200 pressings only. Under the Dome is making a disc of the new material they wrote and played during last night's performance, as well as including some of the music they wrote for the STAR'S END show, and is making available to only 200 fans as a way of helping finance the cost of traveling from Scotland for this one time USA performance. Once the 200 discs are pressed, there will be no more made available. You can purchase this disc by going to www.underthedome.co.uk I'm pretty sure Grant and Colin said they had a few left. All in all, a great night. Both concert wise and encouragement wise for this new band from Scotland, Under the Dome. I'm sure we'll be hearing some more great things in the future from them.